We have a had a couple of light freezes, but tonight should be our first truly hard freeze. 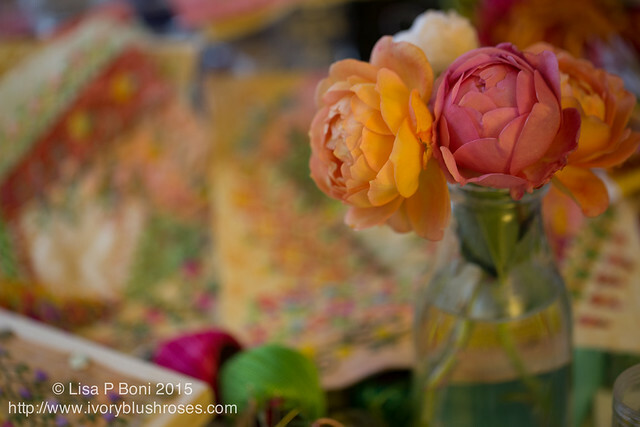 Despite the earlier frost, the roses are still blooming, so I gathered more lovely blossoms to enjoy indoors. When I sat them down on my stitching table, I realized that their colors were just those of my CQJP 2015 blocks! I tried my hand at painting a couple of blossoms a few days ago. I'm definitely still in the "getting back to what I used to know how to do" mode. And trying to learn to paint with loose painterly strokes. It's a learning curve. For some reason, painting flowers has always been really difficult for me, so it's something I'm determined to overcome. After all, they are one of my very favorite things in life! 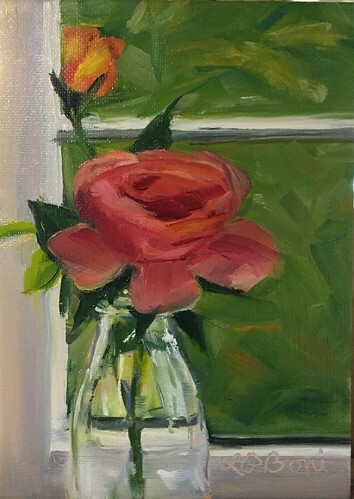 This one is the first "rose" that I've painting that actually looks a little bit like a rose to me. Need more practice! For now, I'm going to stitch on my CQJP blocks and try and get caught up a little while enjoying the last of the garden's lovely blooms! The colors of those roses are beautiful Lisa. I look forward to seeing your block with these colors. I think your painting is very nice! Very pretty. What does the JP stand for in CQJP? 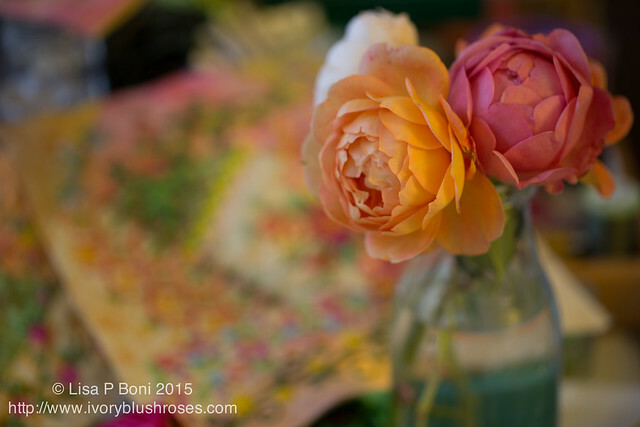 Gorgeous roses and photos of them!